By mid 13 century, the Pope permitted the Hospitaller Order to change its formal color to red to separate the brother-knights from brother-sergeants. Late Hospitaller knights featured better armor, composed of combination of heavy chainmail with steel reinforced akaton underneath the chainmail. The equipment has also expended to use of mace in cavalry engagement once the lances were broken. Dismounted late period Hospitaller knights. 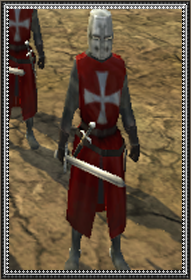 Armed with sword, these units can provide excellent protection of settlement walls during the siege attack. The St. Johns' Hospital allows the recruitment of veteran Hospitaller knights. The St. Johns' Chapter House allows the recruitment of veteran Hospitaller knights.